Engineers prove to be good chasers! Fantastic summer’s day as we trooped off to Shizoka. Shizoka looked pretty, small ground laid with lush green grass cut to fine length by the venerable, grand old man with a synthetic turf pitch in the middle. The cars parked in shade which looked to be a ball magnet (Bobby was a bit nervous and did everything to hide his car). Our very own Biju won the toss (again) and had to do some hard convincing act to impress upon the team for the need to field first and how it will benefit the team in the upcoming KCL. Captain had his way and asked the Nagoya boys to bat first (not sure why he elects to field every time when I am around). Engineers got the first break through when the score was at 11 with me dismantling the stumps of AJ stewart with a seaming in cutter. Things were steady after that as the batters chose not to touch the bouncing ball, whenever they did, it got the edge and went in for runs with couple of possible chances missed in the slips (“one was a bit too high and the other one was a way too low”, said Santosh). Bowling chang worked and Mahesh got us the wicket of steady looking Kiyani, the opener, found the gloves of bobby, the keeper, while trying to sweep Mahesh (work on your pace dude). 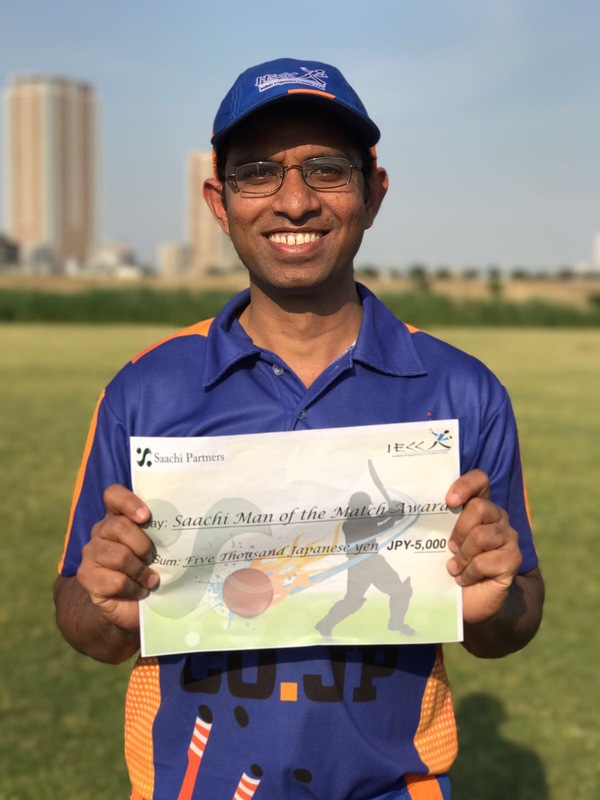 On the other end Nissar kept the pace going and got 2 vital wickets with catches going to Biju and Viswa(a fine running catch). Sanjeeb also chipped in as he cleaned the Nagoya’s captain. Nissar also made Lalit’s off stumps fly in air. If everything looked bowler friendly, you might wonder where all the runs came from. Well, it was essentially a team effort in conceding the extras (scored 70 odd) with byes going away for 4’s (uneven bounce, strayed line). 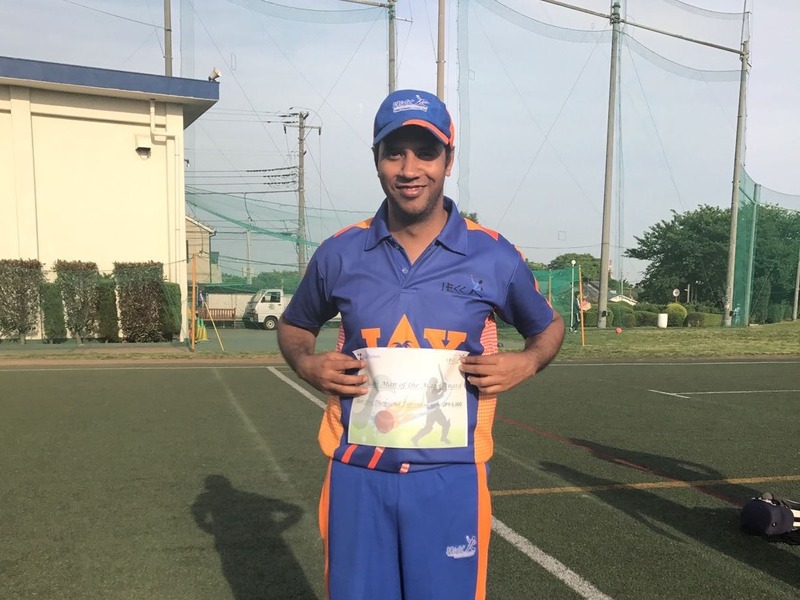 But credit must be given to Hussain (nick named Gavasker by me) who scored 71 in 4s and 6s with Nagoya scoring 110 in the last 9 overs. A few words exchanged as well among the Engineers in panic. (disciplinary committee might want to have a look). 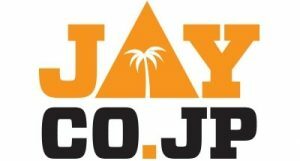 Nagoya were at 155 after 31 overs when the 5th wicket fell and the Engineers were expecting a total of 190 or thereabout after 40 overs. The 6th wicket fell at 167 in the 33rd over and things were ok until that point. But what happened after that was mayhem. Hussain, the new batsman, who claimed he was playing real cricket after a small gap of 17 years, hit the ball all around the park and in no time reached 50. By the time the last ball was bowled, he was 71 not out and and the Engineers were left with a total of 265 to score. Did the captain’s plans go awry? Goshhhhh! what about the buttery hands? We dropped 8 catches and helped some to even go for six. Jagan, Ritesh (“yaar hawa bahut tez hai”), Viswa, Santosh (“ek upar tha aur ek neechey”), Bobby (“it’s mine”) and Biju topped the list. Jagan took two well judged catches only find that he was out side the rope when took them. So, with the target set to 266 in 40 overs the Engineers were somewhat happy as they were sensing some batting practice for everybody(part of captain’s plan?). Nissar and promising new comer and Amol went out to chase but Amol didn’t live up to the expectation of his captain, perishing to the very first ball of the innings(c&b off Aatish), giving the Engineers a disastrous start. Disastrous or over cautious starts, middle order collapse, snatching defeat from the jaws of victory, making innocuous bowling look extremely dangerous – the Engineers are not new to these situations. In walked Bobby, who had a rough patch only last year when he was the captain (pressure of captaincy?). His partnership with Nissar for the 2nd wicket (effectively the opening partnership) lasted for 18 overs yielding 136 runs mostly dominated by Nissar with thumping lofted drives, meanest cuts and some of the bloodiest pulls. Nissar scored his 50 off 36 deliveries. Bobby (34 off 45 balls) hung in well and produced some over the top on the on side strokes but got ambitious and found his stumps disturbed. Vice captain Sanjeeb joined the party and looked “Azhar” to me as he produced some wristy boundaries but fell in just after their partnership crossed the 50 mark. 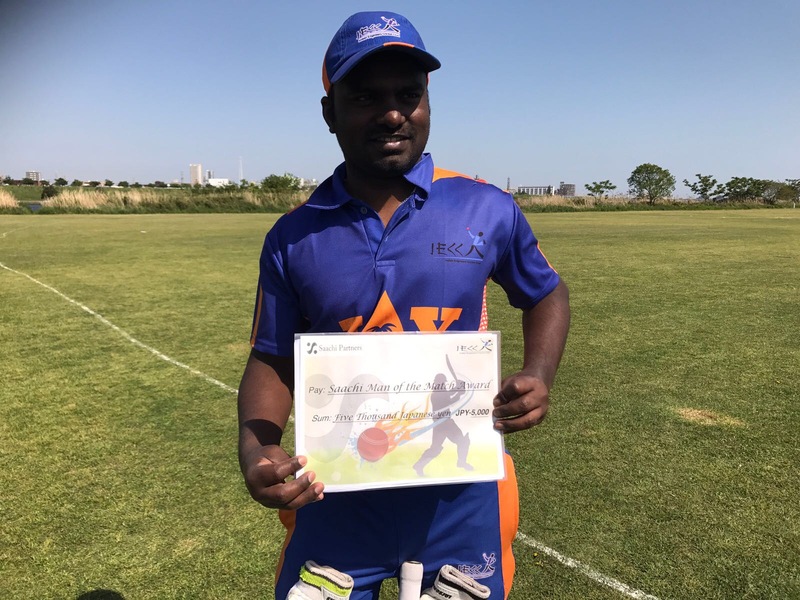 Sanjeeb scored a quickfire 22 off 16 balls. He was caught and bowled by Afridi but there was nothing to worry as Viswa and company were still there. With still 80 odd to get I went in next and held the ground with Nissar who was in the 90s at that time. He completed his century with an on drive for a single and was appreciated by everybody including the opponents. His century came off only 75 balls. Our partnership (75 odd) had taken us to a stroke away from victory and I asked Nissar to score the winning runs and gave him strike with only 2 to get in 5 overs. To everybody’s surprise, he tried an ambitious pull to Aksar with the ball keeping low marking the end of an innings to remember. He ended up with 124(10×4, 6×6). New (old) man Viswa walked in with only 2 runs to get but gave simple return catch to the bowler, who dived to his front, in the 2nd ball he faced. Comical scenes followed in the dressing room. With victory all but assured everyone had started changing to the their own normal clothes some still in undies and no one was prepared to go out next. All of a sudden there is commotion and uncertainty as to who will go next, Santosh offering to go without any protection and in slippers but the one who went out was Silvester, who, half way through to the wicket remembered he had forgotten to protect his most important person. In the end Silvester guided the ball he faced to gully for the required 2 runs. Over all it was the good batting that won us the match (in desperate need of a fielding coach) led by the hostile Nissar. Nagoya will strike back with more venom as half of their bowling battery wasn’t there and the Engineers will try to hold the ground in the next encounter (KCL match). On the way back, Bobby bettered his own record of 2 hours to Shizuoka in the morning by 30 minutes and drove us back (safely, that is!) in 1.5 hours flat, thanks to the unusually near empty Tomei.